Since February 2009 Cirque Bouffon and the GOP Entertainment Group have joined forces. This cooperation found its origins in the common urge to break new ground and achieve new dimensions for the artistic theatre. Consequently to their work, both of them have reached great recognition for their pioneering role and outstanding artistic quality. It is thus a natural result that the GOP Variété Theatre, as one of the most successful vaudeville shows in Germany, and Cirque Bouffon, the best-known ambassador of Nouveau Cirque, work intensively together in the future. At the heart of the conflict between individualism and community, between tradition and innovation, the common goal is to build a new vaudevillian world. The GOP Entertainment Group supports Cirque Bouffon in the creation, production and marketing of the show. GOP’s philosophy of triggering desire, longing and emotions is placed in the centre of the development of this concept. The goal is to establish both products with their powerful performances in the international premium segment and increase their popularity. The first common project is “Cirque Bouffon and GOP on tour”. Palma de Majorca, June 3rd 2009: this is where the premiere of Cirque Bouffon and GOP’s European tour takes place with their new show “Angell”. From June 3rd to July 12th “Cirque Bouffon and GOP on tour” is the cultural highlight of Palma’s culture summer. 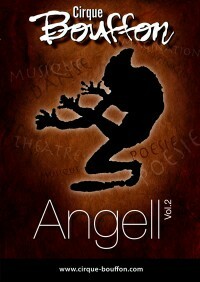 This joint show “Angell” is based on the theme “angel trapped in a parallel world between heaven and hell”. High artistry, stunning costumes and fantastic music in the well-known style of both artists’ theatre promise the viewer an experience of a very special kind. The creative team led by director Frédéric Zipperlin developed a new show, refining the philosophy of the Nouveau Cirque and distinguishing itself from other circus forms. Once again this international artists’ team succeeded to conceive a show that touches the viewer in their heart and takes them away to the magical world of Nouveau Cirque. Far from the mainstream, in a straightforward and thorough way, Cirque Bouffon and the GOP Entertainment Group get to offer the viewer an evening where all the everyday problems disappear. The programme is perfectly balanced through the musical direction of the internationally renowned composer Sergej Sweschinskij, who created compositions of intoxicating intensity. The result is a show that has managed to stand out from the ordinary circus everyday to create a whole artwork. A sensual experience and a show that makes one simply happy are guaranteed. Sergej Sweschinskij studied contrabass and classical guitar at the Hans Eisler College in Berlin. He composed the score for various television and movies adaptations. He also composed the music for the stage show “Balagan”, by the Hamburger Fliegenden Bauten. For several successful years he was seen together with his Berliner band Trio Bravo on international stages and festivals. Anja Krips studied acting, singing and dancing in Cologne; for years she has taken part in several international productions. She works as a choreographer for stage productions and teaches dancing and singing as well. Since 1999 she works together with her partner Frederic Zipperlin on the project “Cirque Bouffon”. Adam Tomaszewski studied at the Music Academy in Lodz. Xylophone and percussion virtuoso, he shows his skills in classical as well as in modern productions. For several years he successfully shared international stages and festivals with the Berliner ensemble Trio Bravo. Nataliya Nebrat is a graduate of the artists’ school of Kiev. She has worked for many years with several shows on international Variété stages – Wintergarten Variété, Apollo Variété, Casino Monte Carlo among others. At the Cirque Bouffon she deals with hoops and loops of all kinds. After finishing his education at the Ecole Nationale du Cirque Annie Fratellini in Paris, Frederic Zipperlin toured for three years with Cirque du Soleil through Canada, USA and Europe. For many years, Frederic Zipperlin worked for renowned international productions; he is an experienced artist and director. Since 1999 he dedicates himself to the creations of Cirque Bouffon. He is a multiple winner of the Parisian circus festival “Cirque de Demain”. Ralph Quabeck studied Travel & Tourism marketing in Cologne; he has worked for many years as senior manager of a prestigious events agency in Cologne. As a very experienced project manager and businessman, he supports and advises Cirque Bouffon since 2006.